Troynoy Island, in the Arctic Ocean north of Siberia, is a weather station manned by small crews of scientists. At the end of August, a female polar bear took up residence near the station. S von, one of the scientists’ dogs, was dead. 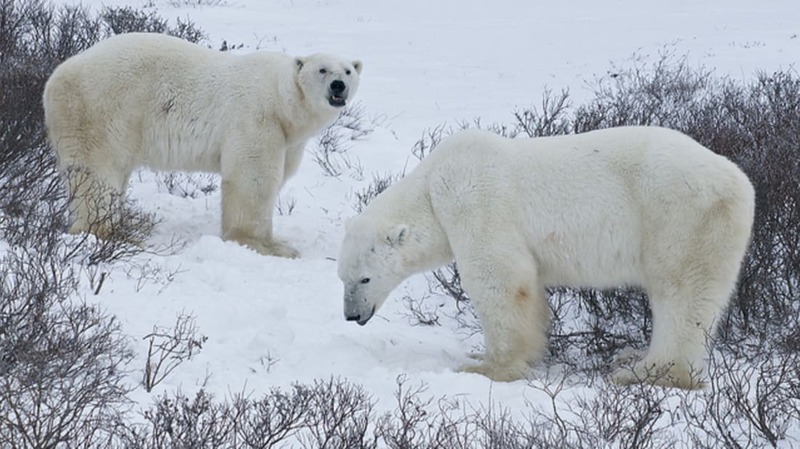 Other bears moved in, and ultimately ten polar bears of all sizes were surrounding the weather station. The five scientists, which included two married couples, ran out of flares they were using to scare off polar bears. A supply ship wasn’t scheduled for another month. The scientists had to stay inside for two weeks as the bears stood by. The standoff came to an end as the research ship Akademik Tryoshnikov happened to be nearby and made for the island. The crew brought flares and other supplies to keep bears away, and life has now returned to normal for the five island residents. The Mid-Autumn Festival in China coincided with typhoon season, so the forecast was for cloudy skies in many of China’s big cities. They worked around that by hanging moon lanterns and erecting models of the moon. In Fuzou, city officials used a giant inflatable moon as a centerpiece for the festival. But Typhoon Meranti has no respect for tradition. Winds from the typhoon, which hadn’t even reached land yet, tore the giant moon from its morning and sent it on a rampage across the city. While the moon wasn’t heavy enough to do much damage, it also wasn’t heavy enough to stay put. Worm fiddling, also called worm charming, is the art of bringing worms out of the soil by introducing vibrations. The town of Caryville, Florida, recently held their own Worm Fiddlin’ Festival and competition. Vying for prizes and bragging rights, men, women and children drove stakes into the ground within assigned patches of scrubby ground and then rubbed the stakes with pieces of wood, axe blades, and even PVC pipe. The efforts were successful as the winner actually compelled over 50 worms to come to the surface through the unusual methodology. The festival is actually a revival, as Caryville used to do this every year until 2008. Let’s hope they can do it again next year. You can see a video of the competition here. An unidentified 24-year-old man drove his vehicle off the roof of a parking garage in Austin, Texas, last Friday. The edges of the nine-story building were secured by five safety cables, but the Toyota 4-Runner snapped through three of them as it exited the building. Two of them became entangled in the car’s axle and prevented it from plunging to the street. The car came to rest several stories up, hanging vertically on the side of the building. The driver climbed out through the sunroof and into the garage before emergency personnel arrived. The Austin Fire Department secured the vehicle and brought it to the ground. The driver is okay, but the car is most likely totaled. You can see a video of the driver escaping here. Lisa Lobree was walking to the Philadelphia Museum of Art on Labor Day when she was smacked in the face. The 16-inch catfish at her feet was the culprit. It had fallen on her from overhead! Lobree suffered a small cut under her left eye and some swelling from the flying fish. She was also hit with a distinct odor. No one was throwing fish at the time, and flying catfish are rare in Philadelphia, so it is believed that the fish was dropped by a predatory bird flying overhead, possibly because it was too heavy.